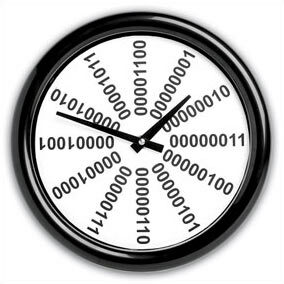 The Binary Clock Tells The World Who You Are Better Than It Tells The Time | OhGizmo! By David Ponce on 11/06/06 • Leave a comment! There are levels to geek. Once you jump off the deep end and start seeing the world in binary code, you’ve officially left geek land, and stepped right into nerdland. You start telling people jokes like: “There are 10 types of people in the world. Those who understand binary and those who don’t.” and you chuckle every time someone doesn’t get it. You even start buying clocks like this one, the Binary Wall Clock, to impress your nerd friends, and confuse your non-nerd visitors. Of course, deciphering the time isn’t much of a challenge, because even though each hour is represented by its binary equivalent, you can still sort of eyeball it. Still, it makes a statement, and at $40, it will leave enough money in your wallet to buy your favorite T-Shirt.